[Way better result (than) I thought possible!!! I got a cell phone ticket and an intersection obstruction ticket and she got it dismissed. 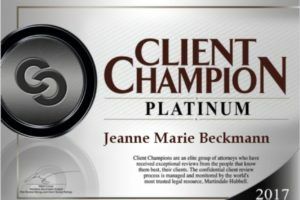 [The BEST attorney I’ve worked with…5+++ stars…I worked with Jeanne Beckmann after I received a traffic violation for “using my mobile device while driving”. Immediately after calling Jeanne I felt relieved and that I was in the right hands. She explained the entire process to me, gave me a timeline so I wasn’t frantically checking the ticket process, and made the process simple. the end results—DISMISSED! 5/23/13 “professional, reliable, responsible..effective!” Facebook The following are CLIENT TESTIMONIALS posted on Lawyers.com/MartindaleHubbell.com for the law office of Jeanne Marie Beckmann, P.C. 3/14/11 “She is the best traffic lawyer I’ve ever witnessed. She got 9 points dismissed for me and I am eternally grateful”. 2/25/12 “I live out of state and needed local Hempstead representation for a complicated license suspension (decade-old outstanding moving violation with an out of state license involving multiple DMV offices and the dreaded National Driver Registry…) What she saved me in fines and fees more than covered her very reasonable fee. Because of her experience and familiarity with the local traffic courts, she was able to resolve it in a single morning. Highly recommended.